Gesang lived in at No. 5 Road Bedoyo Kemlayan villages, SERENGAN, Solo together nephew and his family, having previously lived in the house Perumnas Palur granting Governor of Central Java in 1980 for 20 years. It has been separated from his wife in 1962. Next, choose to live on their own. It does not have children. Gesang was initially not a songwriter. Previously, it was only a singer keroncong for events and small parties only in Solo. It has also created a number of songs, such as at the World Wheel Sound, Sound the strays, and Sweep Hand, during the time of World War II. Unfortunately, all these songs less participation from the community. As a form of appreciation for his services to music keroncong development, in 1983 Japan established Gesang Park near the Bengawan Solo. Management of the park is funded by Gesang Fund, an institution founded for Gesang in Japan. In 2007, Gesdang hospitalized KSOs Solo and undergo prostate operation. In January 2010, Gesang hospitalized again, not long after Gesang returned. Furthermore, Gesang hospitalized Wednesday, May 13 for respiratory disorders and infections bladder content. Sunday, May 16 in ICU this issue Gesang Solo because experienced a reduction in blood pressure. 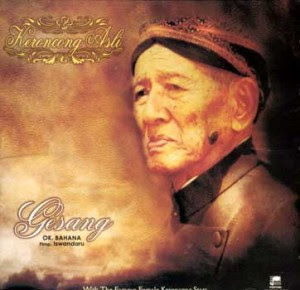 Tuesday, May 18 digosipkan Gesang died, but the news is simply wrong.